falls out of favor, you know, the moment when you no longer reach for it as your everyday carryall as you rush out the door. Whatever the reason, be it style, season, or a hole in the bag, totes can be one of those types of things that I am reluctant to throw out. My current go-to solution came to me at the same time as I was trying to figure out how to keep my laundry items sorted while not burying my entire closet floor in baskets or (yes, I am so glad I got past this) plastic bags filled with the weekly washables. Holes and styles aside, why not use a tote for laundry sorting? Canvas bags and the like have handles, which are a great perk for those of us who may be doing laundry in a city where the facilities are outside the comfort of one’s own apartment. 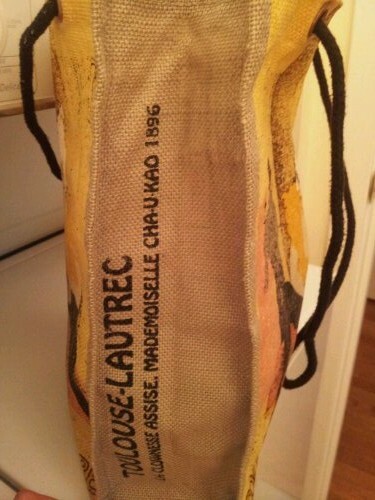 A toast to the famed La Clownesse of Toulouse – Lautrec ‘s artistic imaginings, and to new uses for old things! 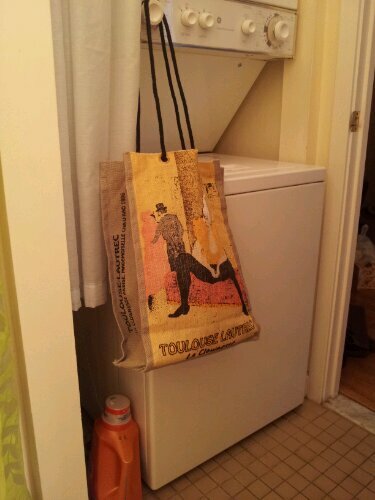 Tags: city living, home organization, laundry, new uses for old things, practical, tote, Toulouse-Lautrec, uses for totes. Bookmark the permalink.